It could be argued that Cape Charles doesn’t need a newspaper, because one stroll through town is usually enough to learn about everything that’s going on. Maybe so, but if you drive instead of walk, or live out of town, you’re going to miss out on some of the news. And with the weather as it’s been for the last two weeks — first rain, then snow, and for the moment still freezing cold — you don’t see many walkers, and you don’t hear as much news. The word “gossip” gets a bad rap. The archaic meaning of a “gossip” was a friend — somebody who knew you well enough to pass on the good stuff — meaning the REAL news. So, friends, let me tell you about my walk through town the day before it started raining, which was two Mondays ago. If you live in town maybe you already know this, but half our readers are out-of-towners. My first stop was at Sullivan’s, which of course is the number-one spot where news not only is heard but also made. I asked Mike if he had a scanner power supply I needed. He didn’t, but that brought me into contact with Jay’s barber shop across the hall. Jay asked me if I had any good news (he meant JUICY news), and I asked him the same thing. If your barber doesn’t know, nobody knows. I say barber, because I go to get my hair “cut.” Women go to get their hair “done,” but it’s all the same — whoever works on your hair knows the news. Vance Lewis popped in, and I took the opportunity to chide him for pulling down the Ewell’s Furniture sign, leaving a blank frame. WRONG, Vance said — he had just put up his own sign, which you’ve already seen unless you don’t live here, in which case just look at the photo above. 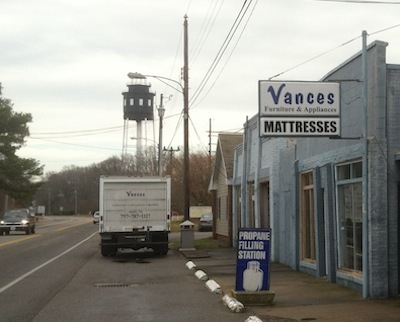 As everybody knows, Vance’s father Frank, our former mayor (who just celebrated a birthday), has retired and sold Ewell’s Furniture to his son. Frank used to work six days a week at the store, but now that he’s retired he’s cut back to five. That’s pretty big news for Cape Charles: Ewell’s Furniture, which had that name even before Frank bought it however many decades ago, is now Vance’s Furniture. But there’s more, courtesy of Watson’s Hardware, which may not make as much news as Sullivan’s but does an even better job of spreading it. I asked Chip what was happening to the former Best Nest furnishings store, which if you have a pulse you already know has moved to Virginia Beach. Chip said that John and Honey were moving Gull Hummock into Best Nest. Now that was news! A store on Mason Avenue doing well enough to expand. A quick stop in the Gull Hummock wine & cheese shop confirmed everything. The old store will close after Valentine’s Day and reopen in a greatly enlarged space the beginning of March. So what about the old Gull Hummock shop? In a game of musical stores, Boytos & Boytos Homes is moving from 223 Mason to 213 Mason. That’s still a deficit, with Best Nest gone. But then Chip took me in to see Mark, who was busy fixing up the former Cape Charles Realty storefront. Turns out that Mark and his wife, new transplants to King’s Creek Landing, are opening a jewelry shop featuring imports from Mexico. That suggests to me that the new shop won’t be a direct competitor with the high-end products at Meredith’s Moonrise Jewelry or the local handcrafted wares at Karen’s Beachglass and Stories. So Mason Avenue loses one shop but gains a new one plus another expanded one. Which brings us back to Sullivan’s. A couple of weeks ago we reported that a business was pulling out of one of the Sullivan suites. We didn’t say who, but everybody probably knows by now that Brady is moving his very successful web design firm to Charlottesville. I thought Dora might not appreciate our printing the bad news, so I was pretty surprised when she thanked me. Turns out that somebody read the story, called Dora, and immediately rented the space. I should know more than that, but the weather’s been bad and I haven’t gotten out and about much recently. I told him I’d been trying for a long time to figure out when the shop was open. “Why didn’t you ask Dora,” Jay said. Which made perfect sense, and in fact was what I finally had done. The CC business district continues its form of musical chairs, but it’s all for the good — an expansion, and a new business. Things are looking up for the summer. Here’s hoping for more positive activity! We have made so many great friends here on the Shore and we wanted to thank each and everyone for their friendship & love. We have many great memories and again, I can’t thank you all enough for being so welcoming and in many cases, adopting us. This is a strong community and we will miss it and the great people who make the ESVA wonderful! Going, but will be back! An entertaining article, I just hope this isn’t the level the Wave will be going to. However, if you read news clips from 100 years ago, it was pretty much the same type of reporting. Possibly a light hearted article every now and again is refreshing, just make sure not to get too personal with the power you have. Something to make us chuckle, even for just a moment, will help with the daily grind. Seems like great news all around. YES the Vacation Rental office of Caretakers and the services of Boytos & Boytos.are moving into the Gull Hummock space on March 1. We have expanded and simply needed more space. The Vacation Rental office expanded into rentals a couple of years ago, now continued growth prompted the name change to “Shore Living Properties”. After all, it’s all things “Shore”. The rental aspect bringing many travelers promotes all local Cape Charles business and look forward to a busy 2013 for all of us. All businesses are welcome to leave rack cards to be included in the welcome packages we provide to our travelers. Feel free to drop them by after March 1 when we get settled. We have been reserving rentals for this year since last June. 223 Mason Avenue will be available for rent at only $300.00 month. Great storefront location as we all know everyone visits the famous “Watson’s Hardware”. Call Chip at 757-695-2779 to grab your new storefront. As a year round resident I am so happy to see these positive changes and expansions in the town. I’m sure Gull Hummock will be happy to have more much-needed space so they might grow their business. Congratulations to Kim Boytos our newest real estate broker in town, specializing in local tourism and vacation rentals. Occupying the same building is Boytos and Boytos. We are fortunate to have a seasoned upscale resident- builder in our town who understands the building requirements on the shore. Stop in and see the beautiful new space and logo for these businesses. We shoppers are always glad to see any new retail. Glad another new business is coming to town. Should be a great summer!